Please note: Fiver2 (which nickname we will use in this interview) is the main graphics artist behind the demo Debris. Lately he calles himself "the united states of america", under which he is credited in Debris. If you have not seen this demo yet download it from here and then read this interview - this would make more sense :) Enjoy! Could you please introduce yourself to our readers? Which groups have you been in etc..
Guten tag. My name is Thomas "theunitedstatesofamerica^fB" Mahlke (aka fiver2). I've been to the demoscene since the early nineties, starting in a local group called "Violence". Then I joined TRSI for a while and after that co-founded Artwork. All that as a pixel artist, or mostly copyist, on the Amiga platform. Then the second part of my scene life began when I got the opportunity to assist the united states of america of elitegroup. He became my mentor and told me everything I know about demos. After the accident I decided that I wanted to become a famous demo director. Why are you called theunitedstatesofamerica, did you change it from Fiver2? Nah, it's not like fiver2 is dead. I just feel more like theunitedstatesofamerica right now. Well, about ten years ago a guy who calls himself 'Chaos' asked me if I was interested in founding a games company together with Mr.Pet, Sol, Sire and Tron. My answer was 'yes'. What things do you like besides computer work? Well, all the usual stuff. And of course I'm especially interested in everything connected to (pop-)culture: music, films, books, musicvideos, occasionally even people. What do you think is the main difference between the oldskool and the newskool scene? Do you like that progression? Today's demoscene is a lot more than just code. Ask ten sceners what the demoscene is all about and you will get ten different answers and all of them are true. And yes, that's a good thing. What is the demoscene all about in your opinion? Creativity in all its forms. I couldn't just name one. I usally prefer demos in which audio and visuals complement each other: State of the Art, Friday at eight, Closer, We took the greenpill, Sor, 00101010, Chaos Theory. I like it if demos have an effect even without considering the technical side. If the code is great, too, the better. My currently favorite demo is Fairytale by Traction & Brainstorm. Tell us all about Debris.. How did the project started? Debris. started at the elitehaus 2005. elitehaus is a yearly event where some sceners are renting a house somewhere in the middle of Nowhere/Denmark for two weeks to work on new projects. (Demos like kasparov, .the .product, poemtoahorse., In control, Candytron, the.popular.demo, .kkrieger, Of spirits taken and Die Ewigkeit schmerzt all grew at elitehaus.) Then debris. 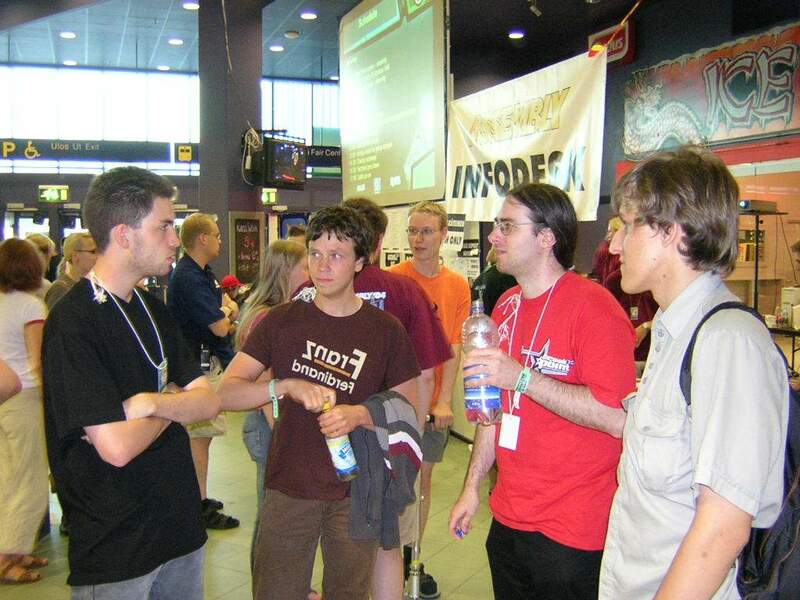 was put on ice for about one year because of some commercial project, restarted at elitehaus 2006, put on ice again until we could finish it for breakpoint 2007. Where did you get your inspiration from for Debris? I could copy/paste from pouet.net here. (read Debris vs Suicide Barbie article elsewhere in Hugi -ed) There has been lots of inspiration. Films like Deep Blue, Dark City, War of the Worlds and Koyanisqatsi, music videos like Go to sleep and Sometimes but also the flooded New Orleans and just keeping your mind spin while walking through cities. I still cannot get images of moving buildings out of my head on my walk home. 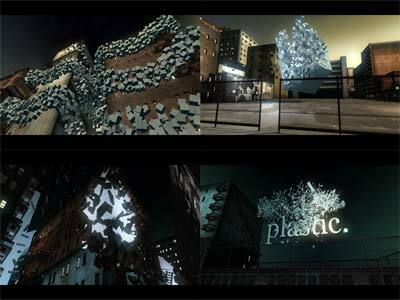 What was the hardest part to make concerning Debris? The hardest part probably was not to lose faith. After elitehaus 2006 I felt like most people (including me) did not really believe in the project despite all the work that already had gone into it. In the end it was more about just finishing it somehow, getting rid of this rock on our feet and our heads clear for new ideas. debris. could easily have been the end of my scene career and I'm glad we managed to get past all those obstacles. Why could it have been the end of your scene career? I guess the negative impact if we had not been able to finish debris. could have been devastating. I don't think I would have started another project. 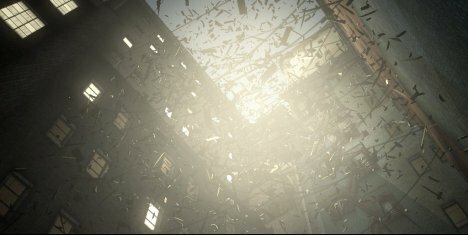 Tell us your experience of Breakpoint 2007 during the pc demo compo, when Debris got played, the reactions you got etc..
During the last weeks before the party i had seen debris. so many times that, even if i was personally content with the result, I had lost every feeling whatsoever of how people might react to it. Another fact made watching the competition even more exciting for me: I had never heard the soundtrack. After all the difficulties we had with the music I decided ten days before breakpoint not to interfere with it any more. Ronny knew what atmosphere I was aiming at and I felt at this point I could only influence the outcome in a negative way so I trusted him completely. You can imagine how excited I was before the competition. Chaos later told me his hands were shaking when he started the demo. Everything from that point on was magic. How do you think Debris will influence the demo scene? Well, I don't think we have to fear too many cubes or shaky camera work and we've already seen more than enough cities already. But it was great to hear of many people who said debris. motivated them to get creative. That would be a good thing. Was Debris originally planned as a 64kb intro? If not why the small file size? Why not a bigger demo? No, debris. was never meant to be a 64k. But after .kkrieger we had lots of unused material lying around so we decided to make one last production based on pure .werkkzeug techniques but without any creative limits. So code, visuals and sound have been created with 64k technology but without concerning any size limit. A much smaller filesize would be possible but that could not justify the effort and creative limitations it would have demanded. After all size optimization is simply boring. The most intense moments have always been the first seconds after one of our demos had been shown on the bigscreen. The moment when all the tension falls down and the applause breaks lose. The first time I was overwhelmed by the reaction of an audience was after .the .product had been shown. It gave me goosebumps and shivers. the.popular.demo was even more intense and now debris. : unforgettable. And the worst moment must have been in 97 at "the party" when we were trying to finish the new Artwork demo. We had not slept for days and it got ever clearer that we would miss the deadline. Azure and me ended up shouting at each other for no reason at all. It was an important lesson to me not to take things too seriously. It already is a bit more in the public. I think the demoscene has developed greatly over the last years. It did not happen by chance that the number of new sceners is solid AND so many old sceners are coming back. Today's scene is still about great code but also develops new appeal beyond just the technical aspects. I think the key for the future lies in developing the creative part of the scene even further. Where do you get your motives from? Are you used to drawing sketches on paper before starting on a picture or logo? I don't draw logos. I use Arial. What programs are you using when making your pictures / graphics? I use .werkkzeug3. Actually that's the only tool I am really familiar with. The last time I touched another 3D software was Softimage 3D in 1999 and I know a little Photoshop. That's it. Please name your 5 most favourite graphicians from the demoscene and tell why they are your favourite. Ra, for being the only true artist. Louie500 for the perfect in-between-school style. Noize for being a good graphician. Navis for not being a graphician. Memon for everything. What is the best picture or most favourite picture you have ever seen made by another graphician? And why do you think this? Sanity Logo by Ra. Because. Can you tell us something about your current and future projects? Well, the original idea for my next demo has just been destroyed by the great comeback of Andromeda. I was planning a trip through a 3D infinite zoom. But I guess that's not so original now any more. There are already some new images floating through my head but the concept still has to grow some and of course I will not reveal any details, yet. But I have already assigned the fr-number: It's going to be 043, that might give you some hint. In any way I will make sure the next project takes a lot less effort than debris. Or as Chaos put it: 'Smaller in scope, larger in size.' But first I will have to get over my lately developed pouet.net addiction. Talking about the new Andromeda demo, what did you think of this demo? Without Debris Andromeda's comeback would have won BP07. Please comment. Before the demo competition there were some rumors about a new Andromeda demo and everybody was like "Oh, you mean ASD?". "No, no, I mean THE Andromeda." "Are you kidding me? Is it for real or just some joke prod?" I guess Andromeda had the right answer to that question. I see the comeback of all those scene legends like Alcatraz, Andromeda, Brainstorm, TRSI and Romeo Knight as a great compliment and gift to todays demoscene, especially as they all showed real dedication in their products. I'm excited to see what's next. Any last words or greetings? Yes. Very special greetings to everybody who helped debris. through the hard times. The last weeks before breakpoint have been crucial and for the first time since years I felt we were working as a team again. You know who you are. Thank you.